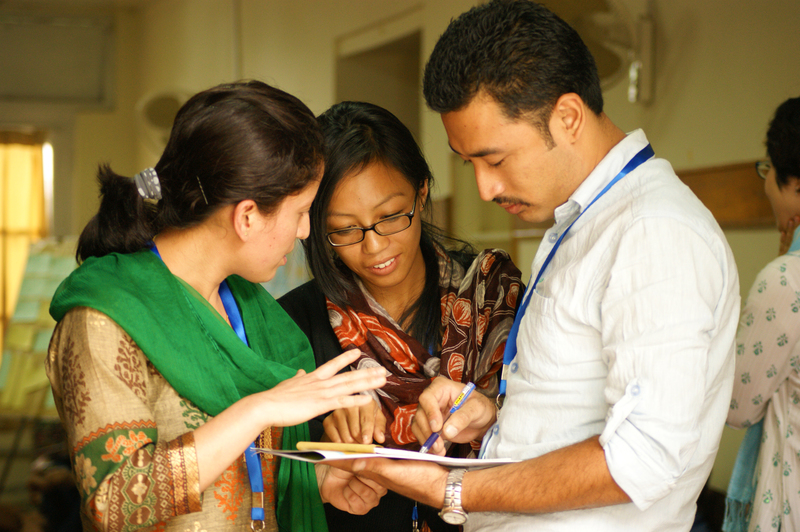 Community World Service Asia offers a variety of capacity building opportunities to support the development of non-governmental, civil society, and community-based organizations. Our goal is to enable people involved in the humanitarian and development sectors to maximize their impact, fulfill their potential, and best serve communities. We employ multiple approaches to capacity development to suit the varying needs of organizations with different objectives, priorities, and resources. What we offer is more than training; we provide customized capacity building programs which consist of many types of trainings, technical support, and follow-up. Our success in training and support has led to requests for training for the staff and implementing partners of such established organizations as Help Age International, World Vision Pakistan, Strengthening Participatory Organization, Lasoona, Lutheran World Relief, and Deutsche Gesellschaft für Internationale Zusammenarbeit (GIZ). Our training service was initiated in Pakistan in 1995. Since then, we have developed a wealth of experience in conducting comprehensive, high impact training sessions and in tailoring those sessions to the individual needs of various organizations working in diverse contexts. In 2007, we conducted our first regional workshop on using the Sphere standards in monitoring and evaluation in Bangkok, Thailand. Our team conducts an average of 50 training events each year, at the organizational, national, and regional levels. We have built an extensive and strong pool of expert resource persons, internally and externally. With specialists from a wide range of fields, including monitoring and evaluation, organizational development, and quality and accountability, our workshops deliver an excellent standard of training. Our training does not end with the workshop. We provide unrivalled assistance to our participants through follow-up mechanisms which have been a defining feature of our service. These include follow-up visits, online support, technical assistance, the establishment of networks, and open communication. Throughout the years, we have pioneered and led in capacity building on essential areas such as organizational development and quality and accountability. Our experience, expertise, and commitment have enabled us to partner with The Sphere Project, and we are currently the Sphere country focal point for Pakistan and the regional partner in Asia since 2005 and 2011, respectively. Capacity building is a key component of our role. All of the courses outlined below are tailored to the participants; needs; however, we also provide organizations customized training and technical support on request. Some capacity building opportunities are tailor-made and only available upon request.